Carryn Anderson, MD, was awarded the Steven M. Grunberg Memorial Award for her research on reducing chemoradiotherapy-induced severe oral mucositis in patients with oral cavity or oropharyngeal carcinoma. The Steven M. Grunberg Memorial Award is reserved for the author of the highest-ranking abstract submitted to the Annual Meeting and rewards demonstrated excellence in supportive care in cancer. Anderson’s winning abstract is titled “GC4419, Small Molecule Superoxide Dismutase Mimetic: Randomized Trial to Reduce Chemoradiotherapy-Induced Mucositis in Oral Cavity/Oropharyngeal Carcinoma Patients.” This multicenter study was sponsored by Galera Therapeutics and was designed to determine whether the superoxide dismutase mimetic GC4419 reduces the duration, incidence, and severity of severe oral mucositis in these patients. In this study, 223 patients with locally advanced OCC, who were treated with intensity modulated radiation therapy (IMRT) and cisplatin (CDDP), were randomized to 30 or 90 mg of GC4419, or a placebo, administered via a 60-minute IV infusion, which ended less than 60 minutes before radiotherapy. Patients were assessed for severe oral mucositis for up to 8 weeks following radiotherapy, with the primary endpoint being the duration of severe oral mucositis. The authors reported that the 90 mg dose of GC4419 produced a significant and clinically meaningful reduction in the duration of severe oral mucositis, as well as improvement in the incidence and time to onset of mucositis with acceptable safety. Intermediate improvements were reported with the 30 mg dose. There were no GC4419-specific grade ≥3 toxicities reported, and other known toxicities of IMRT and CDDP were not increased. Carryn Anderson is a radiation oncologist at the Carver College of Medicine, University of Iowa, Iowa City, Iowa, USA. She is a Clinical Associate Professor and the Residency Program Director in the Department of Radiation Oncology. 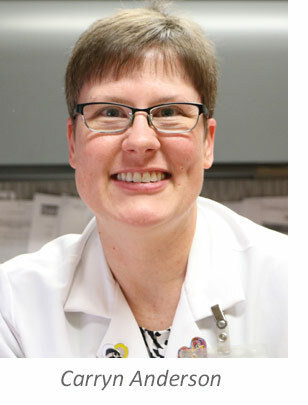 There she works with oncologists from multiple disciplines, including brain and spinal cord tumors, head and neck cancers, lymphoma, melanoma, and sarcoma. She has published numerous papers pertaining to radiotherapy, and its adverse effects, for patients with head and neck cancers, including thyroid cancer, squamous cell carcinoma, and salivary malignancies. Among several other research areas, she has also conducted research on post-radiation dynamic triphasic FDG PET/CT response assessment in head and neck cancer patients and the influence of body composition on survival of patients with head and neck cancers. Disclaimer: The above information related to study results is based on the submitted abstract and does not imply endorsement of any drug product by MASCC. *Anderson C, Lee C, Saunders D, Curtis A, Dunlap N, Nangia C, Lee A, Holmlund J, Brill J, Sonis S, Buatti J. GC4419, Small Molecule Superoxide Dismutase Mimetic: Randomized Trial to Reduce Chemoradiotherapy-Induced Mucositis in Oral Cavity/Oropharyngeal Carcinoma Patients.